With ZFill, a hyaluronic acid filler injection, your doctor now has an easy to use, effective, long-lasting and – in combination with the Zimmer Cold Air Device Cryo 6 – virtually painless tool to extend our youthful fresh appearance, increase lost volume, and minimize wrinkles. The purest hyaluronic acid of non-animal origin is the basis for the new ZFill generation from Zimmer MedizinSysteme. The product line includes three injectable fillers which cover the whole spectrum of facial rejuvenation and volume augmentation. The three hyaluronic acid fillers of the ZFill product line are manufactured according to strict European quality and safety standards. They comply with the ISO 9001, ISO 13485 and GMP (Good Manufacturing Practice) standards and guidelines. Toxicological and biocompatibility tests are carried out in accordance to the ISO 10993 series of standards. The gels are extremely stable due to an innovative, multi-stage manufacturing process. This slows down the body’s own degradation processes, ensuring a long-lasting effect. A rejuvenation effect is visible immediately after the hyaluronic acid treatment. ZFill revitalizes aging skin in a way that lasts. It compensates agerelated loss of hyaluronic acid and systematically moisturises the dermis. The basis for ZFill is pure hyaluronic acid of non-‐animal origin obtained from biofermentation. A special process is used at first for careful alignment of the molecular chains. Cross-linking: BDDE is added to build cross-links between the hyaluronic acid chains. This creates a very dense, threedimensional matrix, making the gel more stable and able to withstand the degradation processes of the skin. – This is why the effects of Z Fill contour² and Z Fill deep² last so long. The product is then homogenised. The gel is now viscous and also very soft and elastic – ideal for even, controlled injection through thin cannulas. This is followed by a complex cleaning process. All surplus and harmful elements (unbound BDDE, proteins and endotoxins) are carefully removed. The result – extremely high purity, well above the strict requirements of the European medical devices directive. The gel then has its oxygen removed, resulting in even higher stability and a much longer shelf life. In the final step the filled gel syringes are sterilised in a steam autoclave. Each individual syringe then undergoes another visual inspection to ensure that it is free from particles. Each ZFill batch is released only after the necessary production and safety tests have been conducted in accordance with the latest European standards. The results are visible immediately after the treatment and will improve further over subsequent weeks due to the stimulation of new collagen formation. Thanks to the innovative ZFill technology employed, the effect lasts for up to 18 months. As a result of its special formulation, ZFill provides a particularly long-lasting effect. ZFill refresh can be used for refreshing whenever you wish. The treatment time depends on the area being treated, but ranges from 15 to 30 minutes. Your doctor will use a very fine needle to inject the ZFill preparation directly into the skin. 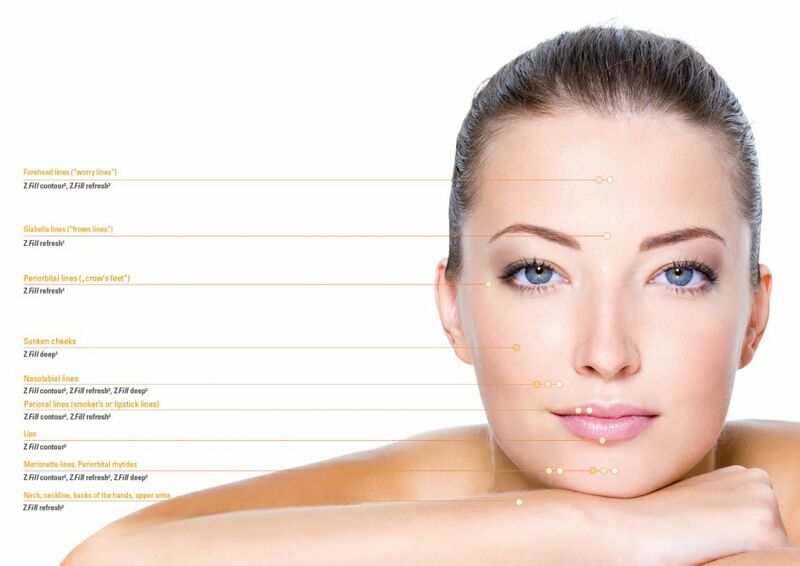 Depending on the area being treated, the injection will be made very close to the surface or in the deeper skin layers. ZFill contains a special gel formulation which reduces patient discomfort. 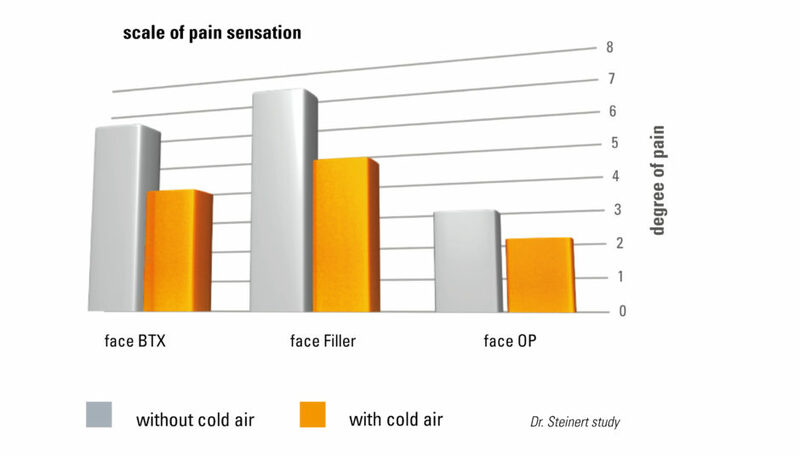 Depending on individual pain sensitivity, cold air treatments may be applied before and / or after the ZFill injections. This has been shown to dramatically reduce patient discomfort. Ask your doctor about this treatment option. An anaesthetic ointment as well as a cooling gel may also be used. What do I need to bear in mind after the treatment? You can return to your normal daily routine immediately after the treatment. Please avoid sun baths, solarium, sauna, laser and IPL treatment within the next 10 days. Allergic reactions are greatly reduced due to the special formulation used in ZFill preparations. Slight reddening and swelling may occur in some patients but generally – disappears after a short period of time. To achieve optimal treatment results, the products – just like all conventional injectable implants – must be carefully but rapidly injected into the middle dermis. Studies have shown that chilling with the Cryo 6 cold air device reduces the patient’s pain sensitivity. This means much better tolerance of the treatment. Following the procedure, the treated area is massaged with light pressure to ensure uniform distribution of the product. The mimetic musculature should be exercised as little as possible for up to 2 hours after the treatment to facilitate integration of the implant into the adjacent cell cluster. A brief period of after-chilling of the treated area can also lessen the occurrence of swelling and reddening.